It is widely accepted that France introduced the concept of hampers to England in the 11thcentury. However, these baskets of food and treats only became a popular gift in the early 1800's Victorian era. The invention of the railways allowed food items to be sent quickly across greater distances to friends and family. These hampers were often filled with with expensive but perishable items requiring fast express delivery. Well to do Victorian families would provide luxury prium food hampers as thank you Christmas gifts for their staff, This is the reason hampers became a special Christmas gift. Christmas hampers were also popular for wealthy home owners to offer their servants on Boxing Day. The baskets would be full of useful items, clothes and food, so their servants could enjoy a plentiful Christmas. Hampers have always been closely related to community, charity and giving. They are filled with food, clothing, toiletries and household products as a goodwill gesture to deprived families in the community. The basket was also a useful item for reuse around the home, while the goods were usually beneficial for a few days or weeks. Modern charitable ‘hampers’ are made within a sturdy bag, filled with canned and packaged food. Most gift hampers are still given to employees, business clients, family and friends throughout the year. Christmas hampers have remained popular gifts, containing delicious festive time treats for the family to enjoy. 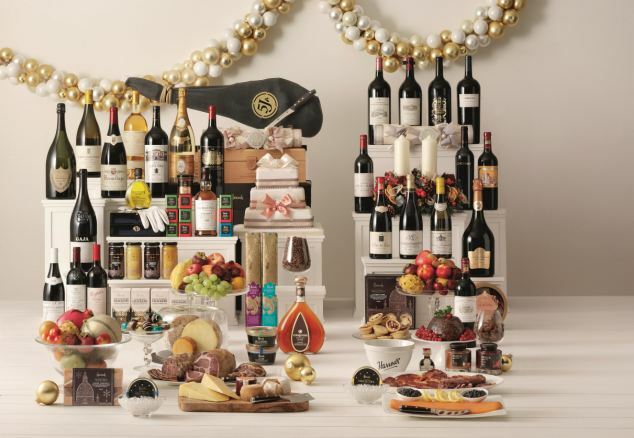 Modern Christmas hampers sometimes feature fresh fruit and bread, delectable desserts and fine wines. Hampers provide a great way to bring the family together at Christmas time to reconnect with great food. What goes in to a Christmas hamper? There are plenty of companies across teh world who will create luxury food hampers. They will source the wicker basket or gift box and treats to make up the hamper. Some baskets have set ingredients, while others may allow you to add additional extras or allow you create tailor-made hampers to suit your recipient. First, find a suitable basket or gift box to put your treats in, whether it is from a local craft store or market. Line the basket with festive fabric or straw and cushion it with tissue paper. Then add a variety of your friends’s favourite festive time food. Choose items that are long lasting and add a few fresh treats too. Christmas pudding, Brandy butter, Mince pies, Assorted nuts, Gourmet biscuits, Fine jams & marmalade, Fine crisps / crackers, Cheese, Chutney, Luxury chocolate, Fine red or white wine, Good Coffee and in Australia some good beers to chill on ice. Whether you are making a charitable Christmas hamper for those less fortunate, offering a basket of goodies to your employees for their hard work, or as a special gift to family and friends, Christmas hampers are always fondly received by all. Where do you find Worlds most expensive premium gift hampers?